Are you in search of a recipe for beef noodle soup? Look no Pho-rther… I say: try Pho (pronounced “fuh”). A popular street food in Vietnam and also here in LA! While passing a Vietnamese restaurant, the other day, I saw a big Pho sign. This triggered not only a sudden craving but also a mind game of phonetics. I got to think of how to use Pho and came up with the title of this article. When Googling Pho I learned I was not the only creative mind. Some Vietnamese restaurants in the US actually use those names. Too funny! For the ingredients I made a trip to the Asian grocery store and picked up some fresh rice noodles, special Vietnamese pre-cooked beef balls, some herbs and spices, among other things. 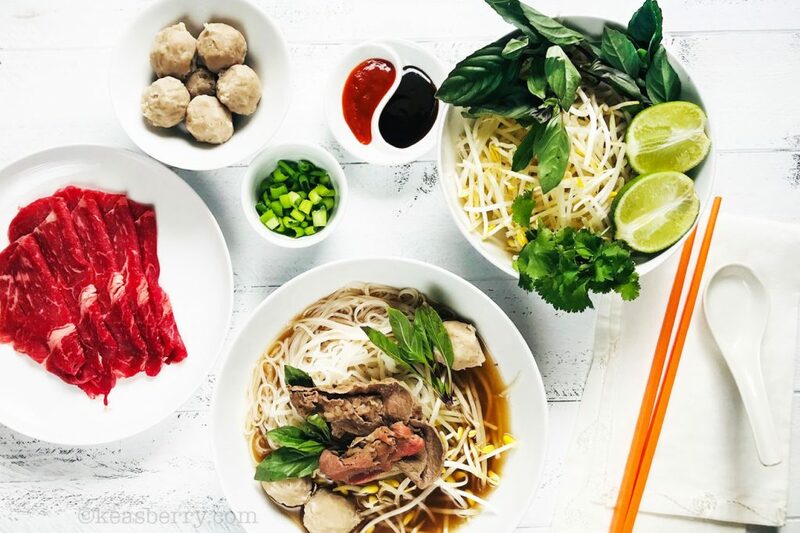 By the way, Pho phits into a healthy eating plan, especially when preparing it at home and when adding the right toppings (watch your sodium intake). It’s low in fat and supplies several key vitamins and minerals. 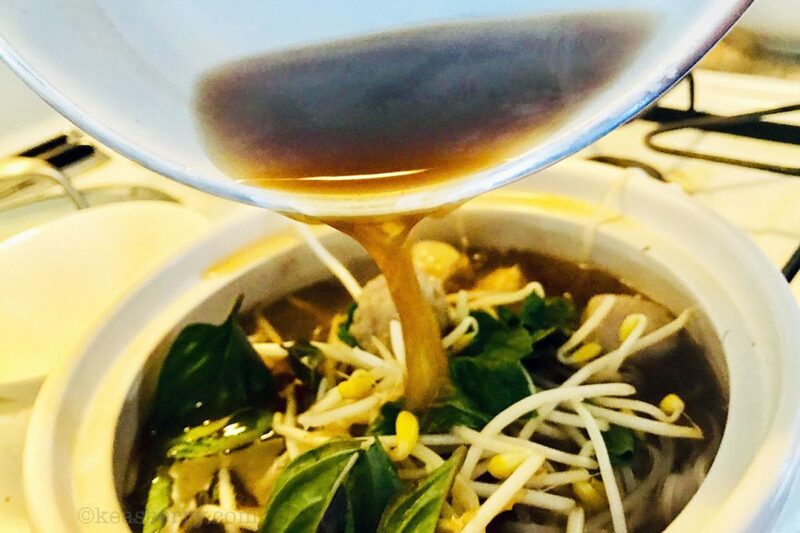 So, it’s actually good Pho you! It can take many hours to even more than a day to simmer and for all these flavors to cook to perfection. I am reviewing a new multi cooker that is a slowcooker, steamer and sous-vide combined. So, I decided to make the Pho in the test model. Just put it on low and cook it slow! I did it for at least 12 hours with the lid closed. For a more intense taste, I reduced the broth by 1 quart by simmering with the lid open for about 2 hours. 1. Put beef bones in a large pot with water and boil over high heat for 5 minutes. 2. 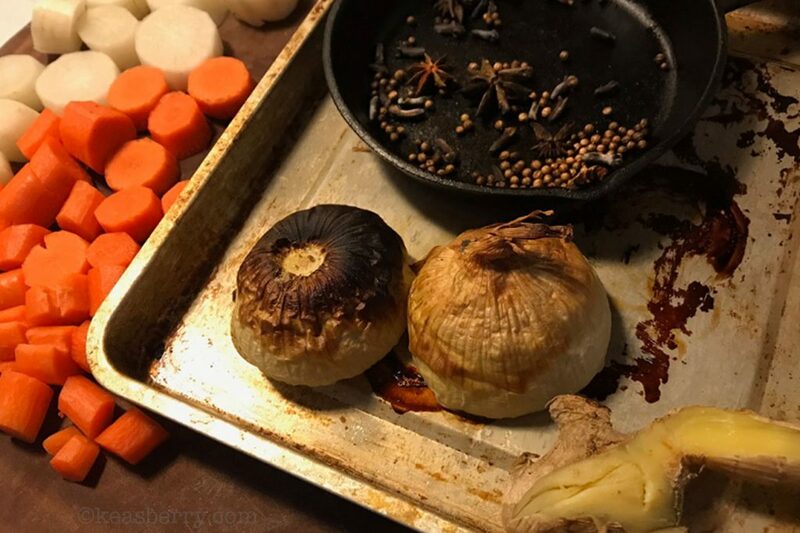 Meanwhile, broil onion and ginger on baking sheet in your oven until lightly charred – for about 10 minutes. 3. Drain the bones and rinse them of anything that formed, place them in the bottom of your 5 quart slow cooker. 4. Carefully remove skin from ginger root. 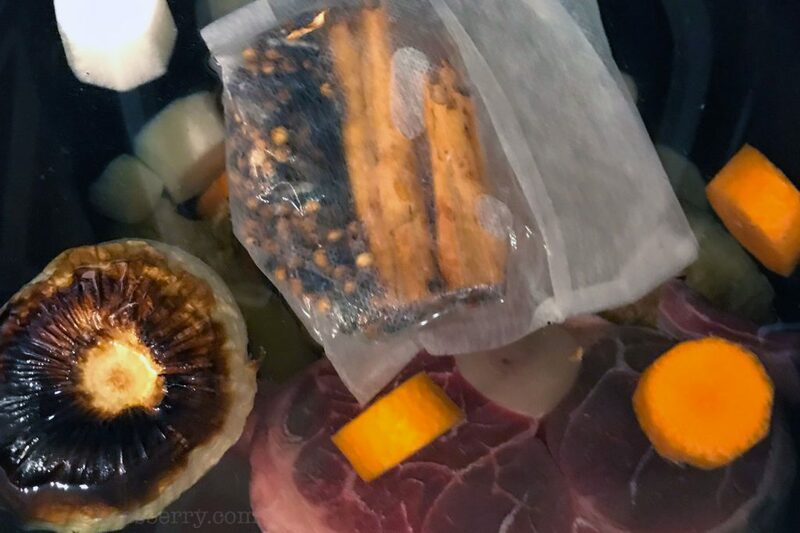 Place in slow cooker with onion and beef bones. 6. Put the spices including cinnamon stick in a cheesecloth/mesh spice bag for easy removal from broth. 7. Add salt, sugar and fish sauce, or to taste. 8. Add 4 quarts of water. 9. Cover and cook on low for 12 hours overnight. 10. Simmer for an additional 2 hours with lid open to reduce broth to 3 quarts for a more intense flavor. 3. Throw frozen beef balls into same pot of boiling water as you cooked your noodles in. Boil for a couple of minutes until the beef balls are heated through. Cut in half for smaller size. 5. Set sliced steak aside. 6. Chop remaining vegetables and herbs. 7. When slow-cooked broth is ready, strain to remove spices and bones. 8. When ready to serve, fill a bowl with rice noodles, and strips of raw beef. 9. Spoon the extra hot broth into the bowl to instantly cook the beef. 10. Top with vegetables and serve with herb garnishes if desired. It takes some prep but when you arrive at that moment of truth, the taste is just Pho-nominal and makes for an un-Pho-gettable experience. If you want a refreshing healthy alternative? Try my Sanur Salad.